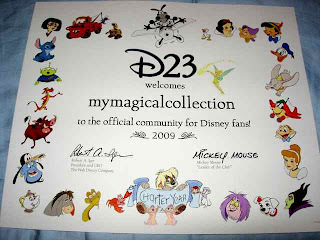 This is the D23 Charter Year Membership Certificate for the D23 Community of Dinsey fans, available at Disneyshopping.com. This club is the official Disney Fans club, and this beautiful, colorful certificate comes with your membership. You get inside Disney information and historical Disney information as part of your membership to this magical club. They've held several fun events that I've attended. It's good that they have so many activities for members- nobody could possibly attend all of them!